Is it good or bad to want more? I think it depends on what you want more of. If you always want more stuff, that can be bad. But if you want more friends or opportunities that could be good. I believe there comes a point where we need to learn to be content with what we have. However if it's Jesus you want more of, that is definitely a good thing. It is also something we all can have. He is more than willing to give himself to us. The more time we spend in prayer, praise and the Word, the more we will become like Him. That's my goal. How about you? What or who do you want more of? Our ladies' Bible Study group. We just completed Redeemed by Angela Thomas Pharr and it was wonderful. I would recommend this study very highly. I also really am thankful for each one of the ladies in this group. They are so precious and we are growing closer together all the time. Looking forward to our fall study. Not sure what it will be yet, but I know God will use it to help us grow closer to each other and especially to Him. I'm so thankful for the time we got to spend with Colton, Kerri and Matt this weekend. We only had a short time, but it was so much fun seeing them and seeing where they are living. Now Kerri and Colton are in Florida visiting Kelli and they are sending pictures. I'm so thankful they are getting time together. His first Mickey ears! Wish I was there. Tigger shirt and shorts and Minion Sunglasses. Looks like a happy little boy! I loved this weekend. On Friday evening after work we came home and did some housework and then relaxed for awhile. We knew Saturday was going to be a long day. Saturday we got up and took off around 8:00am. We were heading to the Chicago area to see Kerri and Colton. On the way, we passed some wind farms. There were windmills in all directions as far as we could see. It was so awesome looking. We got there around 1pm, our time and met them at Joe's Crab Shack. Colton made up with his papaw immediately. Then I got my hands on him. I'm telling you, I just love this kid and I kinda like his mommy too. lol We had such a good time eating and laughing and talking. Colton with Papaw at Joe's Crab Shack. I'm not sure who loves the other one the most! Now GiGi has him and is thoroughly content. I did not turn my head on purpose, but this is such a great picture of Colton. We left there and went to their house. They have such a cute little place and they are working on getting it all decorated. I think they are really happy there. I laid him in is new crib, but he was having none of that. Playing with his stuffed fish on the floor. He is such a happy baby. Almost crawling, but not quite. Gigi and Colton at their house sitting on their new couch. Next they took us to Lake Michigan to a State Beach. It was really nice and they plan to spend a lot of time there this summer. It is only about 15 minutes from their house. Steel Mill across the lake. I'm not sure if this is the one he works at or not. It was very nice at the lake, but rather windy and cold. We had to leave from there in order to make it back home at a reasonable hour. We had church the next morning and didn't want to be too tired. It was a really long day, driving about 5 to 5 1/2 hours each way, but it was oh so worth it! Now we're planning a trip where we can go stay a couple of days. I love to sing and I love to hear others sing. Singing brings so much joy. Well, depending on the song. When we were growing up there was always singing. My mom and dad sang in a gospel quartet at church. My mom's dad sang bass in a couple different quartets. That's my favorite memory of my grandpa. Him singing in church. He loved it. My aunts played piano and sang. I remember always participating in the congregational singing and loving all the special singing. It just touched me. It seems I rarely heard the sermons, but I knew most every word to every song in church. Still to this day I love southern music the best of everything. I'm so thankful for this legacy that was left for me. Click the button above if you'd like to read other FMF posts. This is a little different Thankful Thursday for me. We are in the last week of our Bible Study at church right now. The study is "Redeemed" by Angela Thomas Pharr. What a great study. Well, Wednesday's study was on Psalm 103. I love this Psalm and it definitely lists many things I am thankful for. So today, I'm posting the first 5 verses of the103rd Psalm to show what I'm thankful for. Verse 3 says not to forget His benefits and then the next couple of verses tell us of a couple of those benefits. He forgives our iniquity which means He forgives our sins if we ask. He saves me when I repent. He heals our diseases. Thank God I know He did that for me last year. 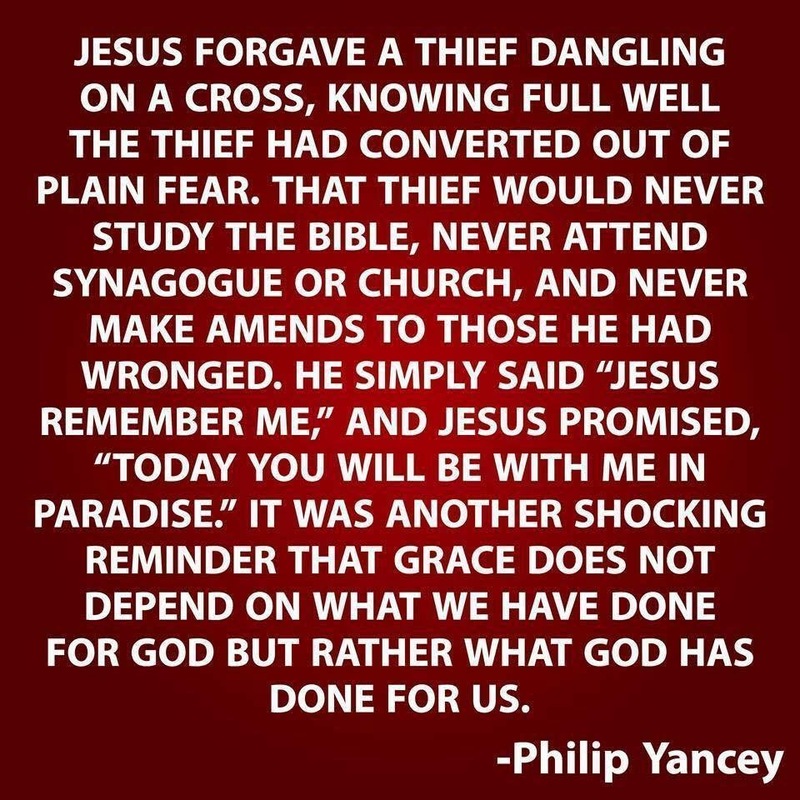 He redeems us from the pit. No matter how far we've fallen or what we may have done, He will lift us out of the pit of sin if we will let Him. Crowns us with steadfast love and mercy. I don't know about you, but I couldn't make it a day without His love and mercy. He satisfies us with good. His good is the best good. This is so cool that He loves us this much. Thank you God. If you get a chance today, read this Psalm. There is so much good stuff in it. Plus it encourages you to "Bless the Lord, O my soul." And that is always a good thing. What are you thankful for this week? Click the button at the top to join in. Raising kids felt that way to me a lot of the time. I'm drawing a total blank on this question right now. I would agree. If we try too hard to find happiness, then we are so busy looking for it, we might forget to be content where we are. I think we need to find happiness, or maybe more correctly, joy in our present circumstances as much as possible; rather than always seeking for that castle in the sky. "Fly Me to the Moon" by Frank Sinatra and the southern gospel oldie "I'll Fly Away" are two that come quickly to mind. Laundry and no, I like the way I do it. It works good for hubby and I. 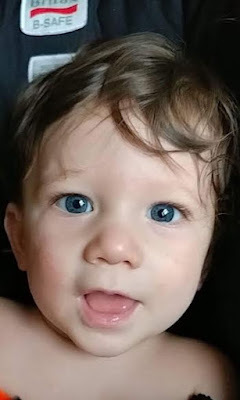 Watching how fast my grandson is growing up. He's already 7 months old. I can't believe it. I probably will not add garlic to my menu. I like garlic in small quantities. My favorite dish with garlic is probably lasagna or some other Italian dish. I'm so excited because hubby and I are planning to take a drive to Chicago to see Kerri and Colton on Saturday. I am so looking forward to it. We've been video-chatting, but Colton doesn't seem to really react to that very much. I can't wait to see him and make him laugh. Look at that cute face. Mommy sent this to me last night. 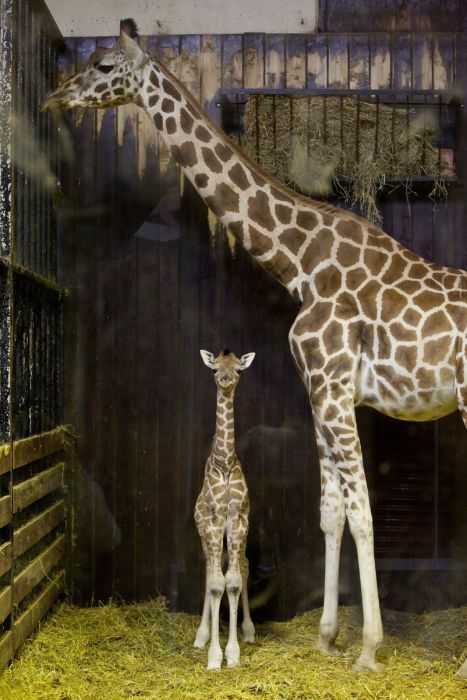 And speaking of babies, did you see April the Giraffe's new baby that was born on Saturday? Hope you've enjoyed my answers. If you'd like to play along, click the Hodgepodge button at the top of the page. Let me know if you do, and I'll come visit you. We have had a nice, quiet weekend. Friday evening we came home and made supper (meatloaf and mashed potatoes) and then cleaned up the kitchen and did laundry. We then watched some TV and just relaxed for a bit. Oh I forgot. When we first got home , a co-worker came by and bought our riding lawnmower. It needs some work, so we decided to sell it. We have someone mowing our grass for us this year. After he left, I ran out and got my hair cut. I like the cut because it is so easy to take care of. Saturday morning after getting cleaned up I put the dog out and sat outside with her for a bit. I took a book out to read and was just settling in and it started raining. Kind of ended that venture early. It was so nice out until it rained. Thankfully it didn't last long. Hubby and I then went out to lunch and drove to Aurora, IN and sat by the river and enjoyed the view. It was nice and sunny now and the temperature and breezes were just perfect. After we left there, we stopped and got some ice cream from. UDF and it was delicious. Next I went to Kohls and bought some new pants for work. I've been needing some for quite a while. Should make getting ready for work easier now. That night we had leftovers from Friday and watched a movie together. Sunday morning was Easter and we had a wonderful service and then went to lunch with Tracy's parents and visited with them for the afternoon. We came home and I spent some time finishing my Bible Studies for Tuesday evening and then we watched some TV. So that was my weekend in a nutshell. How was yours? Today's Five Minute Friday Prompt is: Empty. Is empty good or is empty bad. I guess it all depends on what you're talking about. An empty to do list is a good thing. That means you're caught up. An empty jar of olives is a bad thing. What am I going to put on my salad? It also means it's time to go to the grocery again, which means my to do list is not empty anymore. An empty laundry basket is a good thing. But unfortunately mine is not empty so I need to do laundry after work. An empty stomach can be a good or bad thing. If I'm dieting, it's not good because I'm hungry, but probably can't eat what I want. But if I'm not dieting it's a good thing because I'm hungry and have room to eat what I want. So I guess empty is all in the eye of the beholder. Stop. Wow! 5 minutes can go really fast. 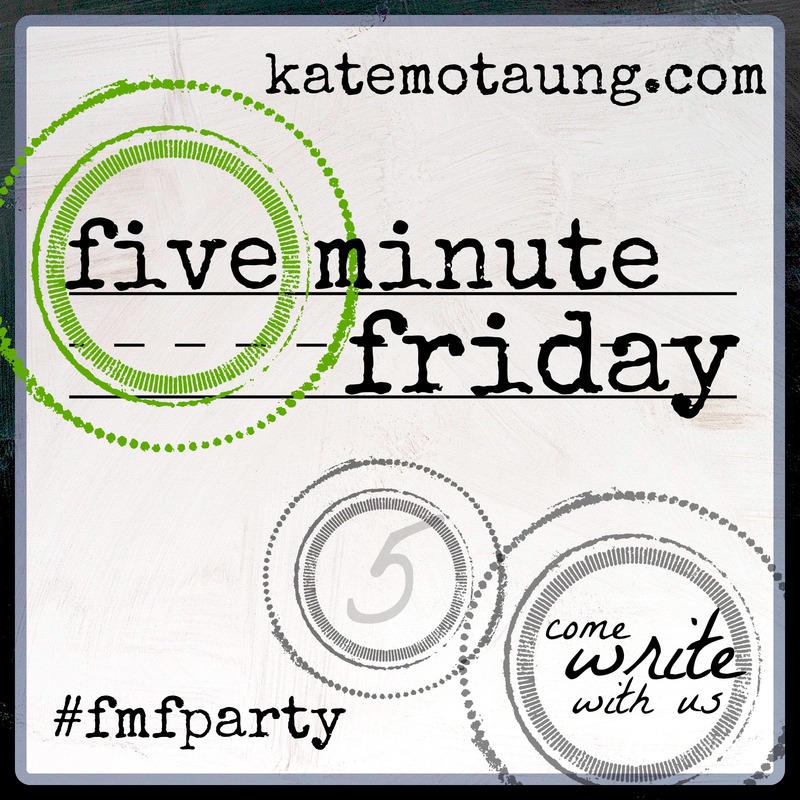 Click the button above, if you'd like to join in with Five Minute Friday. Got to have breakfast with my husband last Wednesday. Nothing special (McDonald's) but it was nice getting that time together before work. Thankful for a beautiful evening walk with my puppy. Also thankful for the beautiful blooms on those trees. God sure makes beautiful stuff! Wonderful time on Saturday with just hubby and I taking a drive and going to Rocky Fork State Park and just spending time together. I love Saturday drives. Thankful for time with my sisters on Saturday night. We went for a quick dinner and then some shopping. We had such a good time together. I love my sisters and am very thankful to have them both. Thankful to get another Virtual 5K in on Sunday afternoon. That's 2 for me! Yay! I'm also thankful for Rebecca who runs this link-up every week which reminds me to be intentionally thankful. And I'm thankful for each one who visits here and reads and/or comments. It was a good weekend. God is so good to me. I don't deserve His grace, but I sure do appreciate it. So here's some of what we did. I woke up early on Saturday and read for a bit and then dosed back off and didn't get up until after 8:00am. I love starting a Saturday this way. Hubby and I then headed out for a Saturday drive. We stopped for lunch at Ponderosa and then headed out to Rocky Fork State Park. It has a beautiful lake and we just relaxed there and talked and just spent time together. What a beautiful day. It was so fun watching the boats. Although they are not in this photo. Kerri video called while we were there and showed me Colton's first Easter Basket. Isn't that just too cute. Colton loves Minions. Then it was on to Walmart and our regular Saturday shopping trip only we were a lot farther from home than normal. Nothing exciting purchased, but definitely needed items. Then we headed home as I was supposed to meet my sisters and we were running a little late. When we got home, I helped hubby unload the van and then ran right back out the door to meet my sisters. Evidently, Lucy was not happy at all that I left. Hubby sent this picture. Doesn't she look so dejected. He said she stayed like that for about an hour. Poor baby. My sisters and I went to dinner and then shopped for a bit. It was a good time. I really enjoy being with my sisters and am glad we are making an effort to be together at least once most weeks. Sunday we went to church and had a wonderful Palm Sunday Service. The kids' Sunday School teacher brought Palm Leaves for the kids and taught them about Palm Sunday. They then brought the Palm leaves into church and had them wave them every time God or Jesus was mentioned. It was so very cool. I can't believe how many times during the service God or Jesus name was mentioned. I mean it should be that way, but I just didn't realize how often until I saw the palms being waved. It really was so very neat to see not only the kids but quite a few of the adults waving those palms. I can't even explain how it made me feel. God is so worthy of our praises. After church, hubby and I had lunch and then went home. I decided to do my next Virtual 5K for Earth Day. It was such a beautiful day and perfect for a walk. Lucy walked almost half of it with me and then I dropped her off at home and finished on my own. Here's the award. Sunday evening we went back to church and had a great Bible Study. Then it was home where I tried to catch up on my Bible Study lessons that I had gotten behind on this week. And now it's back to work on Monday morning. 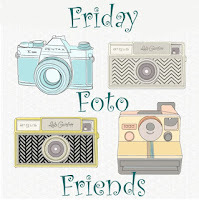 It's time for Friday Foto Friends. Click the button above and you can join in with us. Hubby and I enjoying heading out on Saturdays and driving back roads and seeing what we can see. Here are some photos we've taken over the last couple of weeks. I've never seen a round barn before. Isn't it pretty? Burial site of Annie Oakley and her husband Frank Butler. They died just a few weeks apart. Rumor has it that she was cremated and then when he died her ashes were put in one of her shooting trophies and buried with him. They said he died from a broken heart after she died. This is a red headed woodpecker at our bird feeder. It's not the greatest picture because the screen is on the window. He always hangs off the feeder like this when he eats. I so love driving around our state and exploring things I've never seen before. It's time for Thankful Thursday. Click the button above to join in with Rebecca Jo at Knit by God's Hand. Video Chat - I'm so thankful for this as I'm getting to spend time with Kerri and Colton. Makes my heart happy. I actually got to sing to Colton on Saturday night before bed. Such a sweet time for this GiGi. I just love this sweet face! My Sweet Hubby - He's always so willing to do anything for me. He contacted me today to see if I needed anything for lunch. I had brought my lunch, but I wanted a diet Coke and a small fry. He went out and got it for me. I am so blessed to have this man. Health - I got my port out on Friday. I am so thrilled to have this out. I just feel like that's another step in the right direction. God has been so good to me in this battle with cancer. Now to just live each day at a time and trust God with everything else. So what are you thankful for this week.? It's Wednesday which means it's time for the Wednesday Hodgepodge. If you'd like to play along with the rest of us, just click on the button above which will take you to Joyce's blog. She has the questions, you give the answers on your blog and then link-up on her page. It's a great way to meet new people and to learn more about your fellow-bloggers. But first before you leave, won't you read my answers and comment. I love comments. Have a great day!! 1. April is Lawn and Garden Month. On a scale of 1-10 what's the current state of your lawn and/or garden. (10=a showpiece, 1=send in the professionals). Tell us about any lawn or garden plans you have for this month. Maybe a 3 or 4. Definitely need to put out some mulch this year. Right now we need mowing bad, but we're having too much rain. The only other thing is adding some baskets of flowers for the front porch and baker's rack I have out front. 2. "Many things grow in the garden that were never sown there. "~Thomas Fuller What does this quote mean to you? Never heard this and not sure I agree. I think we reap what we sow. But I'm sure there is more to this quote than I'm getting right now. Hopefully, I'll learn something from your answers. 3. What's the first thing that comes to mind when you think about God? 4. If we were chatting in person, how would I know if you were nervous? My face might be red and I'd probably be fluttering my hands around some. 5. Do you like the color yellow? Would I find any in your home or wardrobe? Daffodils, tulips, roses, sunflowers, day lily, black eyed susan...which yellow bloom on this list is your favorite? I do like yellow. There's none in my house, but I'm hoping to use it in my bathroom when I get around to painting and updating it. I don't wear much yellow. On this list, probably sunflowers or black eyed susan would be my favorite. But actually, I like the yellow dandelion. I think it's pretty in the green grass. 6. Flip flops or bare feet? 7. Tell us about any Easter plans, celebrations, or traditions you'll carry out this month. Church for sure and then usually we go to lunch with my husband's family. No other plans, other than sending something to my daughters and grandson. Not totally sure what yet. 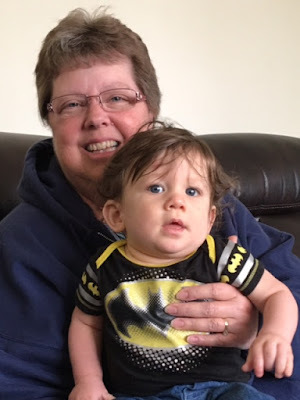 Over the weekend my youngest (the one with my grandson) moved to the Chicago area. Boy, I already miss them! I'm happy for them, but it's breaking this GiGi's heart. However, hubby said we'll make a trip up to see her in just a few weeks. Can't wait! !